Watch the animated version of this (in Chrome)! This summer, I taught a workshop on Arduino and physical computing for employees at Valve Software. The workshop description is below. Inexpensive electronics and microcontrollers can combine to form a platform for physical computing applications with endless variations. Arduino, an open-source electronics prototyping platform created in 2005 at the Interaction Design Institute Ivrea, was designed to make the process of using electronics in real-world applications accessible to makers of all ages and stripes. Today this platform fuels a community of DIY makers around the world who use basic electronic components (sensors, LEDs, motors, etc.) connected to Arduino boards and programmed to create all sorts of projects. Time lapse camera controllers, bicycle computers, weather stations, drawing bots, unmanned aerial vehicles, retro and rudimentary games and consoles, wearable input devices, plant waterers, fortune tellers, laser harps, and well, you get the idea. 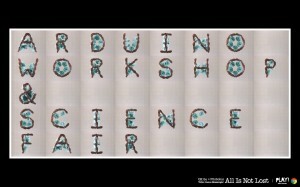 This workshop is designed to get you up and running and experimenting with Arduino. You will learn the basics of physical computing and get a chance to create your own applications and systems. You will each work with your own Arduino kit and a laptop to assemble microcontrollers with wires and electronic components (no soldering necessary), learn simple Arduino programming techniques, and do a series of exercises to familiarize yourselves with the platform. No prerequisites — you’ll start from scratch on the hardware and software. Once everyone is comfortable with the basics, we’ll look at the universe of possible applications and you will brainstorm your own project ideas to be created during the second half of the workshop. This may require sourcing additional parts not in your starter kits. You’ll then design and build your projects with guidance and troubleshooting assistance from me. This will all culminate in a final session, a “Science Fair,” where we’ll share our results, and possibly even kick back with the tasty beverages our new robots fetch for us.